We are Manufacturers of Hypermarket Racks, Supermarket Wall Racks, Corner Racks, Cross Bar Racks, Island Racks and Slatwall Racks from Chennai, Tamilnadu, India. We are involved in manufacturing a wide range of Hypermarket Racks using superior quality material. These are designed as per the specific application and are suitable for displaying an extensive range of products. We also provide customized display accessories as per the specifications detailed by client. 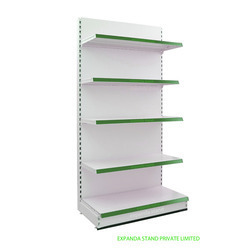 Expanda Stand heavy duty gondola consists of back uprights and additional front uprights to provide uniform distribution of load, thus providing strong and sturdy constructional feature. Label holders are provided for each shelf to make the gondola more attractive and functional. 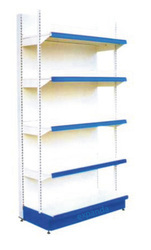 Moreover, each shelf is designed to take heavy loads upto 300 Kg. Load Capacity Up to 300 Kg. Manufacturer and Supply of Island Racks are also termed as ‘Island Gondolas’, ‘Aisle side racks’, ‘Centre Racks’, ‘Double-side racks’, ’A type Racks’. They can come with numerous features, which include products being displayed on end caps, which have been shown to be very effective as a sale feature. There is much scope for creativity that any store can achieve the desired affect with the use of gondolas shelves. 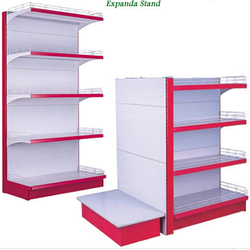 Expanda Stand Hypermarket Racks, These heavy duty storage racks are custom designed for display of each product innovatively & economically. The flexibility in design allows us to modify the racks into exclusive display system for the product. Manufacturer and Supply of Corner Racks unit is used in hypermarket to enhance the appearance and better utilize the store space. The corner unit can be joined to wall unit to create an attractive corner display. The corner unit depth should be matched to that of the wall unit it is to be joined to. Manufacturer and Supply of wall racks which also termed as ‘Wall units’, ‘L type racks’, ‘Wall side racks’, ‘Single side racks’. 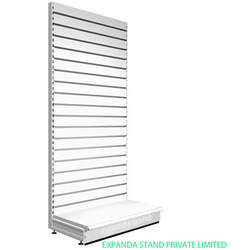 Expanda stand’s wall racks are stand-alone design which also supports add-on modules. 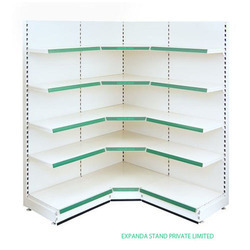 The specialty of ED shelving system is the kick panels at the bottom with rubber stopper in the front to prevent dust accumulation underneath the racks and also small products entering below the racks. Manufacturer and Supply of Slat wall Racks are the most useful display rack in hypermarkets which helps to create eye-catching displays that can easily be changed according to the products and seasons. 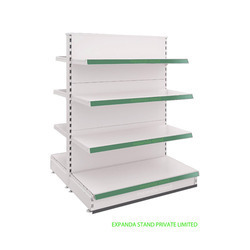 Expand stand offers slat wall panels which are suitable to Wall racks, Island racks, and End racks. The slat wall panels are hooked directly into the slotted uprights wherein the slat wall hooks can be mounted and products can be displayed.